Where does eye color come from? It’s something we’re born with, the specifics written into our DNA. Whether your eyes are blue, brown, hazel or something else, you can thank Mom and Dad for whatever color of eyes you happened to receive. Let’s explore the genetics of eye color. Each person is born with 46 distinct chromosomes, divided into 23 pairs. Each parent provides half of each chromosome pair. Chromosomes are made up of genes, instructions the body uses to create cells and proteins. Genes are comprised of DNA. Alleles are segments within a gene that determine eye color. Each person receives alleles from both parents, found in the paired chromosomes. A persons eye color is determined by genetics, or the genes they receive from their parents. But, it isn’t as simple as a blue eyed parent makes a blue eyed baby. Since each person receives genetic information from both parents, a child can have a completely different eye color than both of their parents. What Gene Controls Eye Color? There is more than one gene controlling eye color; this is one reason why there are so many different eye colors. Currently there are three known genes that impact eye color. Two of the genes are found chromosome 15 and a third is located on chromosome 19. There are two different types of alleles: dominant and recessive. Alleles determine how a certain characteristic will look (in this case eye color).Two identical alleles will result in that same characteristic being manifest (for example brown eyes). This is called homozygous. If the two alleles are different, or heterozygous, the dominant allele will determine eye color. Brown is dominant over blue and green. Green is dominant over blue. While a person with a recessive and a dominant allele will have the dominant eye color, they will still retain the recessive genetics which can be passed on to future children. This is how brown eyed parents end up with a blue eyed child. Parents that are curious about the potential eye colors for a future child can guess at potential eye colors using genetic knowledge or a handy online eye color prediction tool. What makes a blue eye different than a brown eye, or a green eye different than a blue eye? It all comes down to pigment. Melanin is a pigment that is found in the skin and also the eyes. More melanin means darker eyes and less melanin means lighter eyes. There are two distinct layers to the iris. All normal eyes have melanin in the back layer. The melanin concentration in the front layer determines eye color. Brown eyes have the most melanin, green eyes have less and blue eyes have no melanin in the front layer of the iris. Albino eyes have no melanin in either layer (front or back). How Common is Each Eye Color? What eye color is the most common? Which is the least common? The odds of a particular person getting a certain eye color is determined by their genetics, but eye color statistics from the United States can help you understand how common each eye color is. Blue or gray eyes are the are found in almost a third of the population. Dark brown eyes are the next most common and are found in 25% of the population. Brown irises with speaks are found in 16% of the population. Overall brown eyes are more common than blue. Green eyes are very rare. Other eye colors like green and hazel account for the remainder. Different eye colors are more common in different parts of the world. For example in Sweden blue eyes are the most common while in China brown eyes are more common. Ireland has a relatively large percentage of green eyes. Eye color percentages and statistics can also change with time. Colors that were most common 100 years ago might be less common now. 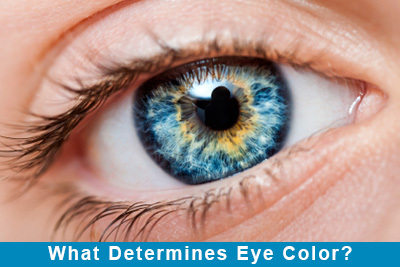 What determines eye color? It isn’t something you can choose; your genetics determine what color your eyes will be. So whether your eyes are blue or brown or something else, you can thank Mom and Dad for whatever color your eyes might be. What eye color do you have? Sound off in the comments!